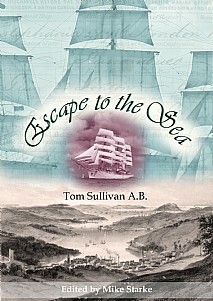 Written by Tom 'Jack' Sullivan Green, AB of Bristol in the 1920s, Escape to the Sea is an inspiring, first-hand account of survival against the odds of an orphan boy in early Victorian England. Recounted in a fluent style and peppered with dialogue, this gripping tale of a seaman's life chronicles both tragedy and comedy amongst the everyday lot of a working world unimaginable in the modern era. Tom traces his early life when cholera claimed his Irish immigrant parents in the London slums of 1848; being apprenticed to a tailor before running away to sea to escape a 'miserable life'. His new life as an Ordinary Seaman began at Rochester on a West Hartlepool-based ship, but when a new and tyrannical skipper made terrifying death threats he was again forced to run away. Walking from London to Liverpool in 1866 to try his hand on trans-Atlantic passages, he gives a chilling account of the last public hanging at Stafford of a murderer, William Collier. Later in the same year, Tom's travels take him to Georgia, USA where he gives an eye-witness account of the tragic plight of slaves who were freed after the American Civil War. Homeless and weakened by starvation and disease, they came to the river bank to collect driftwood only to be grabbed by alligators. This description and other harrowing sights he saw ashore leave a searing impression of the aftermath of a devastating conflict. Following various brushes with authority, Tom changes his name to Jack Green and lies low taking shore jobs near Cardiff where he turns down working the Severn Tunnel due to claustrophobia. Eventually settling and marrying near Bristol, he experienced more exotic times as a mariner before he 'swallowed the anchor'. These included plying the former slave routes to West Africa; accompanying the third mate of his ship with some locally-recruited native sailors to collect the future bride of a chieftain which incurred a series of adventures, some at gunpoint. Escape to the Sea is complemented with documents such as the author's discharge certificates, illustrations of vessels and harbours visited, maps and photographs including his hand written will, which required that 'when the breath is out of my body' it should be buried 'with no ceremony whatsoever'. A modest end for a colourful character whose wish was that his experiences should be made available to a wider audience than his immediate family. This action-packed maritime autobiography will be of especial interest to anyone with an interest in maritime history, ships and shipping and anyone looking for a good read.